As speculated, AT&T this morning confirmed an agreement to acquire AppNexus, effectively making it the ad-tech foundation for the fledgling AT&T advertising and analytics unit being led by Brian Lesser. “We went out and found the strongest player in the space,” stated Lesser, who has had a long relationship with AppNexus, including a seat on its board -- until he left WPP to join AT&T a year ago. AppNexus, which began life as so-called DSP (demand-side platform), has diversified into a fully integrated, end-to-end ad technology enterprise, and absorbed much of WPP’s own ad-tech assets as part of a strategic investment WPP made in AppNexus under Lesser’s helm. Terms of the deal were not disclosed, but A&T reportedly is paying $1.6 billion for AppNexus, which has about 1,000 people, including some 400 software engineers deemed to be among the best in ad tech. That places an exit value of about $240 million on WPP’s 15% stake in AppNexus, but also means it has divested itself of many of its most strategic technology assets, which were the basis for maintaining components of WPP’s Xaxis and [m]Platform operations, thus raising questions about WPP’s continuing dominance among Madison Avenue’s so-called trading desks. AT&T, meanwhile, said it will continue to invest in and build on AppNexus’ “foundational technology,” including plans to integrate the “first-party” data AT&T has on subscribers of its TV, broadband and wireless services. AT&T boasts 170 million “direct-to-consumer relationships across its wireless, video and broadband businesses.” That reach is primarily in the U.S., but with the acquisition of AppNexus, AT&T will effectively also extend its footprint into Asia-Pacific, Australia, Europe and Latin America. 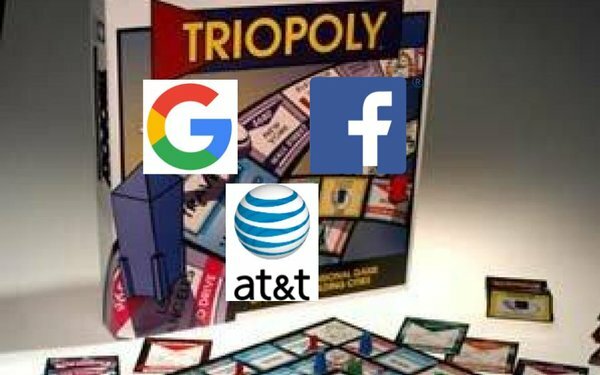 The long-term goal clearly is global dominance, or at least the ability to become the third dominant walled garden in what Madison Avenue not-so-affectionately refers to as “the duopoly:” Google and Facebook.